I think I could eat rustic, California, fresh everyday! The produce is amazing here. Anywho... if you need to detox after yesterday's Christmas meal, here you go! My best friend's boyfriend, Chris Parker, cooked one night for us and that was the night I feel in LOVE with Salmon. When I find something new usually I kill it (eat it breakfast, lunch and dinner) and then I am over it very quickly... but with this recipe I keep coming back. It's super easy! And one of the bohoBlack sisters is now a cooking machine (a.k.a bohosarah) so I thought it was appropriate to share an easy and healthy recipe to get us through the week. Season salmon with salt and pepper. 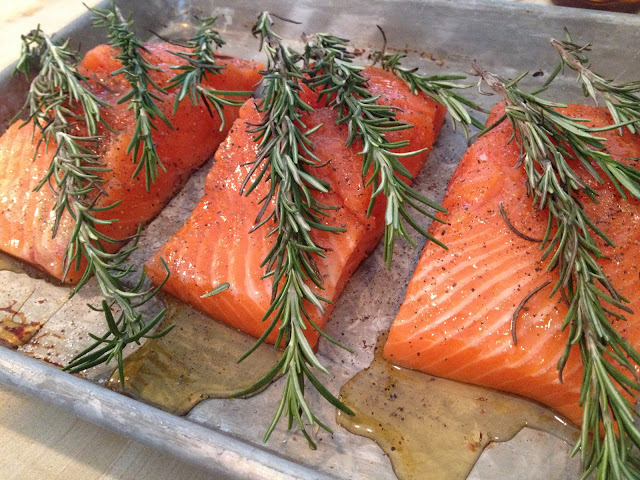 Place salmon skin side down on a non-stick baking sheet and drizzle agave on top and add rosemary sprigs. Bake until salmon is cooked through, about 10-15 minutes. Yes we are on twitter as bohoblack. Thanks so much for following our blog!! !